:: William Rempel, a veteran investigative reporter, recently wrote a comprehensive biography of industrialist and philanthropist Kirk Kerkorian published by Harper Collins. 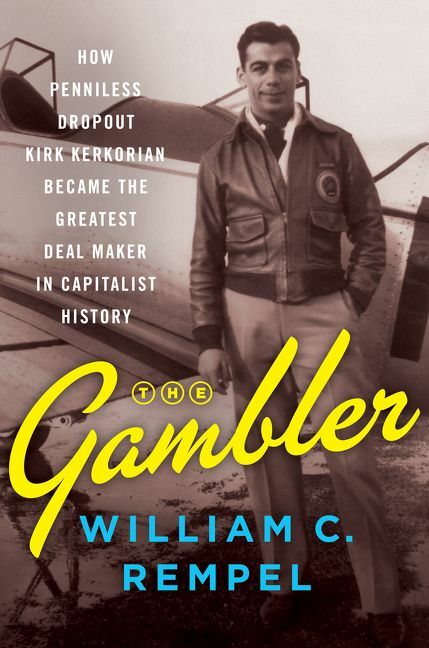 The book is titled The Gambler: How Penniless Dropout Kirk Kerkorian Became the Greatest Deal Maker in Capitalist History. Rempel has meticulously pieced together the details of Kerkorian’s phenomenal and extremely private life through war records, business archives, court documents, and recollections and recorded memories of longtime friends and associates. When Kerkorian’s new multibillion-dollar CityCenter hotel-casino complex at the heart of Las Vegas ran into financial trouble in 2009, Rempel wrote that Trump initially expressed some sympathy: “I love Kirk and hope it works out for them.” Trump then turned around and called the CityCenter project “an absolute catastrophe” during an interview on CNN’s Larry King Show. Trump later stated: “It will be the biggest bust in the history of real estate…too bad.” Of course, Trump was wrong in his prediction. Kerkorian, once again, bounced back on his feet and CityCenter became a great financial success! One of the key advantages of this biography is the extensive coverage of Kerkorian’s philanthropy for the Armenian-American community and the Republic of Armenia. In the past two years, I spent several hours with author William Rempel to brief him about Kerkorian’s contributions to American-Armenian charitable organizations and major projects in Armenia. Rempel described me in the book as “Publisher of the California Courier, an English-language Armenian weekly based in Glendale, California, was also president of the United Armenian Fund [now Armenia Artsakh Fund] and the driving force behind Kirk’s Armenian charity efforts.” In reality, Kerkorian himself was the driving force behind his charitable giving. He really cared about the Armenian community’s wellbeing and Armenia’s prosperity. Although Kerkorian remains a well-known and highly respected name among Armenians worldwide, many non-Armenians are unaware that he was an Armenian-American. Fortunately, Rempel’s biography devotes three chapters to Kerkorian’s Armenian heritage and philanthropy. Chapter 12 of the book is titled “The Armenian Connection.” It describes Kerkorian’s chance meeting in Las Vegas with Manny Agassi in 1963, a waiter at Tropicana hotel and a fellow Armenian originally from Tehran, Iran. Manny became a close friend of Kerkorian and named his future son Andre Kirk Agassi, who became a famous tennis player. Rempel also described Kerkorian’s business dealings with George Mason (Elmassian), his longtime stockbroker, and the founder of the California Courier newspaper in 1958. In chapter 31, Rempel described the tragic earthquake of Dec. 7, 1988, in Northern Armenia and how Kerkorian agreed to join the United Armenian Fund in sending over 150 airlifts for the next 25 years to transport $700 million of humanitarian aid initially to the survivors of the earthquake, and subsequently to the entire population of Armenia and Artsakh (Nagorno-Karabagh). The biographer Rempel also described how the United Armenian Fund was founded, a coalition of the seven largest Armenian-American charitable and religious organizations, including Kerkorian’s Lincy Foundation. Alex Yemenidjian was chairman of the United Armenian Fund, and I was its president. Chapter 36 is titled “Genocide and Generosity.” It described Kerkorian’s first-ever visit to Armenia in 1998, on his private jet, accompanied by me. The chapter relates conversations about Turkey and the occupied Armenian lands during the flight to Armenia and discussions to fund new projects by Kerkorian’s Lincy Foundation. I was subsequently appointed vice chairman of the Lincy Foundation to oversee $242 million of infrastructure projects in Armenia and some in Artsakh. This revealing book also includes amusing anecdotes about Kerkorian’s uncomfortable stay in an old Soviet-style mansion, which forced him to switch to the Marriott Hotel, and his traumatic visit to the Armenian Genocide Museum in Yerevan. Kerkorian’s biography is the fascinating story of a unique human being. He was a brilliant businessman, an extremely modest philanthropist, a true American as well as a true Armenian. As a last indication of his kindness and generosity, he departed this world in 2015 at the age of 98, leaving his entire fortune of $2 billion to charity, in addition to the $1 billion he had already donated to American and Armenian charitable causes through the Lincy Foundation. I recommend that every Armenian buy a copy of Kirk’s biography and suggest it to their non-Armenian neighbors, friends, and colleagues. Kerkorian’s incredible accomplishments bestow a great honor on Armenians worldwide.